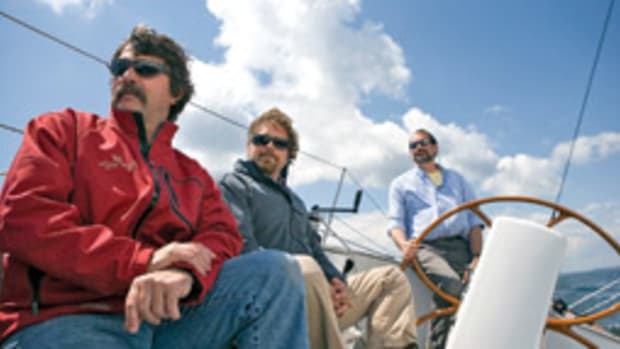 Sailing in Casco Bay in the summer is much like riding the freeway during rush-hour traffic. Chris Kean, who lives aboard her 1983 41-foot C&C sailboat, Soulmate, at DiMillo&apos;s Old Port Marina in Portland, Maine, is one of those hard-core sailors you see on the bay these days, enduring the bitter cold and the pain of the wind screaming at her face to sail. Kean, 51, and a few of her friends bundle up every Sunday - barring rain, snow, or severe storms - and take an afternoon sail. They dress for a sail as a skier would dress for a mountain: lots of layers, a warm coat, hat and heavy gloves. They carry foul-weather gear in a bag. "As long as it&apos;s not snowing or raining, at noon I&apos;m out of here," Kean says. "Some days it&apos;s very brisk and cold. Other days it&apos;s beautiful, the sun is shining on your face, keeping you warm. Some days it&apos;s like sailing in the spring." And for the most part, they&apos;ve got Casco Bay to themselves. 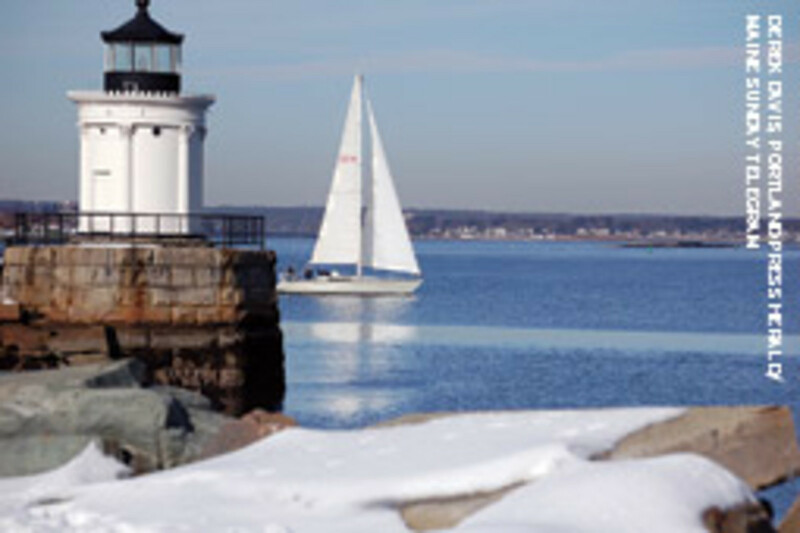 Usually, Soulmate cruises around Portland Harbor and sometimes anchors out at the nearby Peaks Island, or they sail farther and circumnavigate Chebeague Island and sail back to Portland. If the wind&apos;s just right, Kean will take her C&C up to Harraseeket River at the northern corner of Casco Bay. The sailors usually talk about sailing experiences, boat repairs and sailing trips they plan to make in the summer. "It&apos;s invigorating when we&apos;re out there by ourselves," says Michael Howell, who works at South Port Marine in South Portland, and has been sailing with Kean for the last nine years. You&apos;ve got to love sailing to do this. That&apos;s what this is all about." Kean got hooked on sailing the first day she stepped onto a sailboat in 1992. It was a J-24 named Trick or Treat. She had no idea how to sail, but the captain, George Tonini, then 70 years old, took Kean under his wing and showed her the ropes. 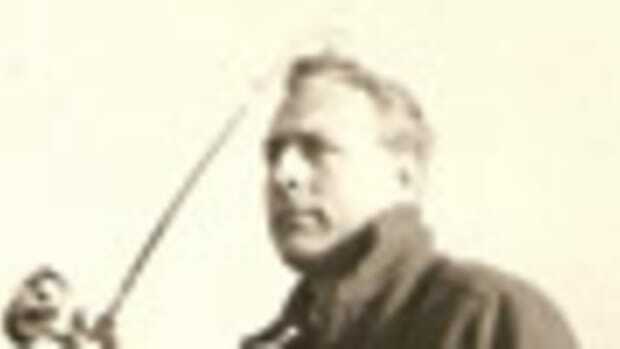 Kean raced with Tonini for three summers and considers him a sailing legend in Maine. He died in February 2009. "George was a great racer and sailor and I&apos;ll remember him always for giving me the opportunity to learn from a master." Soulmate is Kean&apos;s first boat, which she bought in 2000. 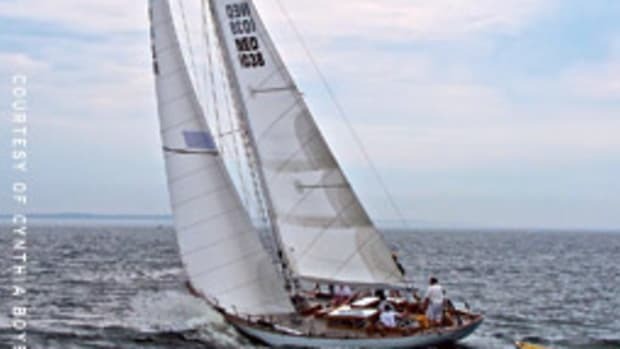 In July 2001, Kean entered Soulmate in the 363-nautical-mile Marblehead-to-Halifax Ocean Race. 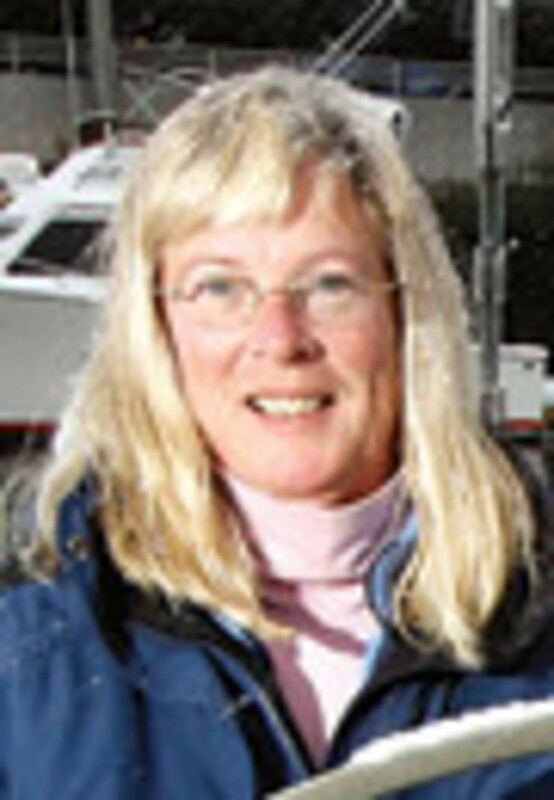 It was the first of dozens of sailing races she has competed in through the years. She had an impressive start to that race, clearing 180 miles of the course in the first 24 hours. During the second half of the race, the crew hit a storm with 10-foot seas, she says. "We had 14 to 15 hours of total mayhem trying to stay afloat and keep moving," Kean says. "Then, we got becalmed. No wind, flat seas and pea-soup fog. It was an adventure. It was pretty exciting." In 2007 she earned her 50-ton captain&apos;s license and last summer worked as a captain and deckhand on the M/V Sagadahoc, a former Navy 50-foot utility boat used for personnel transport. She captained the boat for Long Reach Cruises, which offers tours on the Kennebec River for visitors to the Maine Maritime Museum in Bath. Kean has lived aboard Soulmate for nine years. The C&C was built in Canada and designed for racing and cruising. 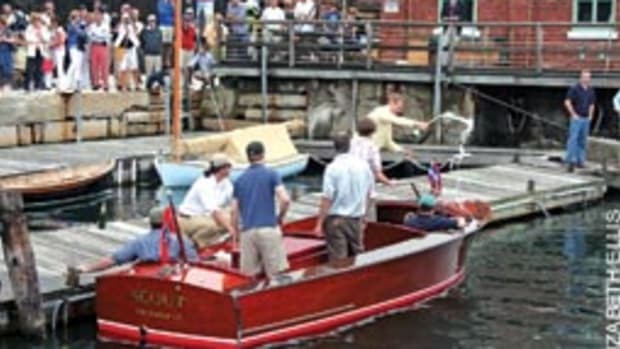 It draws 7 feet, 10 inches - a detail she is very aware of as she cruises Maine&apos;s rocky coast. "She&apos;s sleek. She has a thin keel and she is very responsive, so I can maneuver around things very quickly," Kean says. "She&apos;s strong. She&apos;s been good to me. It&apos;s home." On windy days, the Sunday crew aboard Soulmate practices reefing and heavy-weather skills. Kean says it&apos;s an ideal time to practice man-overboard drills because an emergency situation will likely happen with heavy winds and seas. 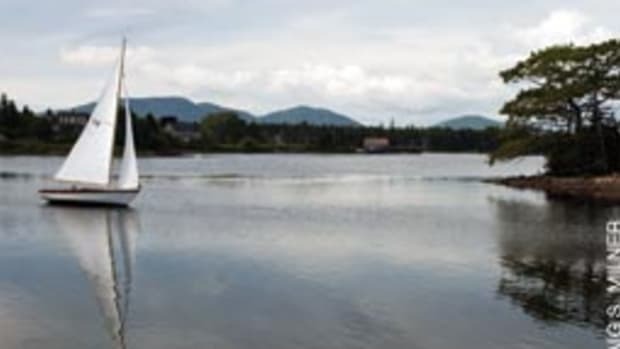 She says it&apos;s challenging to handle the sails and maneuver the boat to pick up a hat or pair of gloves that occasionally blow into the water. "The most important part of cold-weather sailing is to recognize the danger," says Howell. "If someone falls in the water, they&apos;re as good as dead," he says. "The shock of the coldness makes you gasp. You go into hypothermia very quickly and could possibly have a stroke or a heart attack." Kean carries on her C&C two hand-held Garmin GPS units, a 12 and a 48, along with a life sling, life raft, and man-overboard pole. She also installed a 45,000-Btu hurricane hydronic heating system. The burner is behind the engine in the stern of the boat with hoses running to four heat exchange units: one in the galley, two in the main cabin and one forward next to the V-berth. Kean says the system can keep her boat at 70 degrees even when the temperature dips below freezing. Hank Welch of Washington, Maine, another member of Kean&apos;s winter sailing crew, drives more than an hour to make the Sunday sails. "My significant other thinks we&apos;re crazy," Welch says. " That is her right."